This is always my first ‘welcome to summer’ recipe. Although tomatoes won’t be in around where I live until July, they are not the star here so I don’t mind using those Kumato ones. This is a definite tiny kitchen recipe: just one pot for the pasta. Pasta options: After trying penne and some sort of short ziti, I’ve settled on conchiglie. You could try bow ties or rotelle; there’s probably a lot of fun pastas that would work here. Other options: You could add some oregano or maybe some sliced Pepperoncini. Time note: I usually mange to get everything chopped and ready to go by the time the pasta is ready. Get the pasta water going; add salt if you want. Then get a big bowl, big enough to hold all the pasta and the rest of the stuff. I have three white mixing bowls that nest together, I use the largest one. In a two cup Pyrex measuring cup, add the mayonnaise. Slowly add the vinegar while stirring, then slowly add the olive oil while stirring. Run as many cloves of garlic as you like through the garlic press ( I used four big ones) and add to the mixture. Add pepper to taste. Set aside. Cut the tomatoes into a small dice. Put them in the bowl and sprinkle with sea salt flakes. Cut the olives into a small dice and add this to the mayonnaise mixture. Next cut the red onion into a small dice and add this to the mayonnaise mixture. Skin the cucumber and cut it in half; with a spoon, remove the seeds, then slice into strips and cut into a medium dice. Put these in the bowl around the tomatoes. Finely chop the parsley and add it to the bowl. When your pasta is done, run it under cold water to cool it. Once it’s cooled, add it to the bowl and mix together. Then add the mayonnaise mixture and combine, and then add the feta and mix until just combined. Put in your bowls and serve with? In my house it’s water with lemon. Notes: For olive oil, I use Columela— it has a sort of spicy flavor, for sea salt flakes, I use Maldon, and for pepper, I use the Tellicherry variety. I use table salt for anything mixed in or cooked and save the sea salt flakes for finishing or roasting. Using these ingredients adds a little extra flavor to the dish and they’re getting much easier to find now. 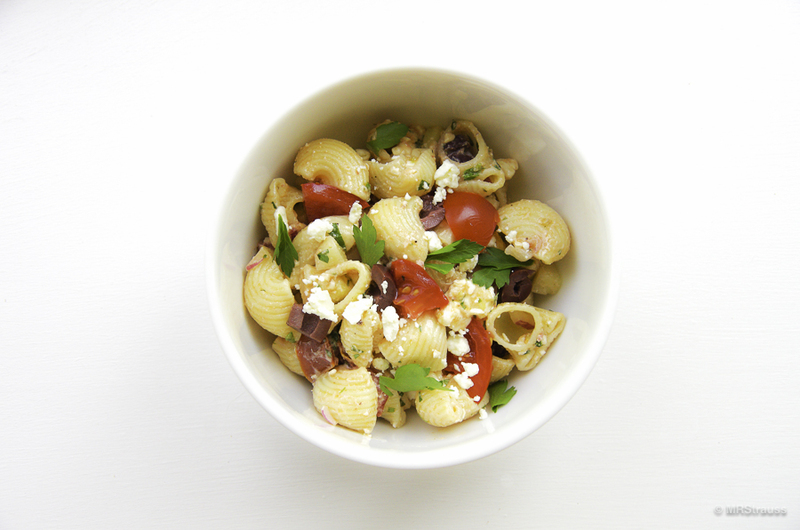 This entry was posted in Bentosh and tagged Conchiglie, Cucumber, Feta, Kalamata Olive, Pasta, Tomato on May 31, 2016 by mrstrauss.